There are many decorative and functional additions that are being added to gardens now – fountains, statues, fire pits, and here and there even a garden gnome. Even if you don’t have a green thumb, this is not a problem since there are so many other things that can be done with a yard to make it attractive. All of these things can be added without actually have to plant anything. Benches are something that allow you to take a load off while also providing a nice look out in the back yard. A bench makes a great place to read a book or just sit for awhile and enjoy the great outdoors in the spot. Appreciate the area you put the seating in. Any type of yard can have a water feature added to it. Recirculating fountains, reflecting pools, and small waterfalls are just some of the options. You can find water fixtures big and small to fit in your backyard. Put one in the corner, or find a large one to place right in the middle. This attracts birds for you to watch, puts more beauty into the space, and gives you something nice to listen too. You can go as extravagant as you want with them as well. They set the mood. Ponds are another tranquil addition. Add fish and other creatures, as well as lily pads and so many others beautiful things. You will have a great place to sit and relax while enjoying the day. Keep in mind, however, that ponds – especially those with fish – require frequent maintenance, so consider how much time you have available for upkeep before you have one installed. Think about adding gravel or decomposed granite as a walkway instead of the traditional cement hardscape options. You can enjoy a little more nature this way and it can be more cost effective. 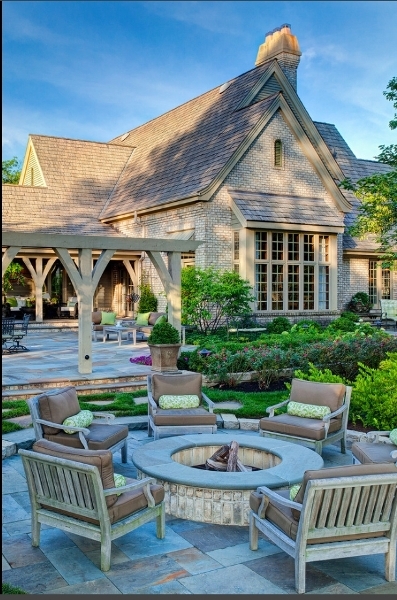 Fire pits can provide a wonderful place to hang out and hey, did someone say S’mores? Entertain in these areas and create an eye-catching area to enjoy. Outdoor kitchens and eating areas can add to the area and allow you to bring people together while enjoying an outdoor meal. It also means you get to enjoy the garden while you cook and eat. Creating a nice little stone path can help lead people to where you want them to go. It looks great and gives you a place to follow when you want to go deeper into your garden or lounge area. Add a pergola to create a more luxurious, yet shaded area to relax when the sun is high and the temperature is hot. A pergola or arbor can create a dramatic and elegant entry area to your yard as well. Add statues and accents such as gazing balls in those empty areas around the yard. They can add a finishing touch to an otherwise drab looking area. This brings more art, color, and design and allows you a focal point while relaxing outside. Any type of art is great to have outside. You do not have to stop at statues – you can grab gnomes and other outside creatures that make up the look of the garden and yard. Add the smaller pieces to the garden to create an enchanted area and add a little more color in those smaller uncovered areas. Low-voltage lighting can add finishing touches in any yard and they can illuminate those areas that you might want a soft glow over. Add them down your walkways, in your garden, and on your patio. Smaller fences and masonry walls might be the perfect touch needed for your garden. Try a nice white-washed wall around it, or other special features that make it pop out of the landscape. Dress up the area and make it look as beautiful as ever. These are just some of our suggestions for adding unique touches to your landscape design. An attractive yard is one which flows with the house and reflects the personality of the owner. If your yard is looking a little drab and you’d like a professional touch to make it really “pop” this summer, give us a call.